Paying tribute to those no longer there for us. There?s going to be a Friends Reunion! Except, well, there isn?t. Not really. Sure, it?s understandable why NBC would sell it in such a way, given how popular the sitcom remains over a decade since it left the air (just see all the news articles and celebratory tweets about it). But it?s probably not going to be Ross, Rachel, Chandler, Monica, Joey, and Phoebe. 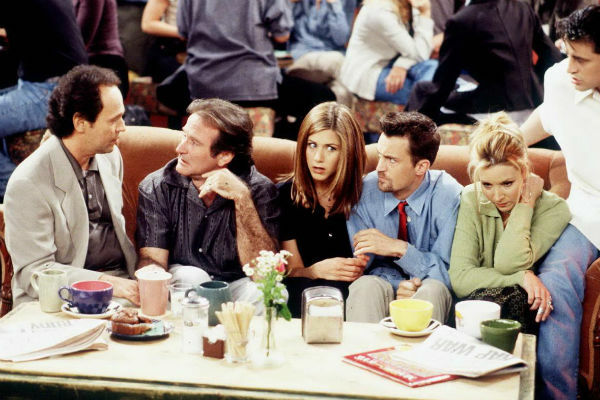 It?ll be David, Jennifer, Matthew, Courteney, Matt, and Lisa, getting together to help pay tribute to director James Burrows, who, among his many TV credits, directed 15 episodes of the show, including the very first episode. It?ll be nice to see them all together again and reminiscing about their time on the show, especially for those of us who like to imagine that in real life they?re all still best friends who hang out at a coffee house all day (it can?t just be me? ), but it isn?t a proper reunion. That?s something that likely will never happen, and nor should it, because Friends ended perfectly. However, with talk of the original cast getting back together, it?s a good time to remember the show and the actors in it. And not just the main six. While they were the heart of the series, one of the best aspects of the show was the numerous guest stars, and minor characters who would appear to deliver a memorable line or two, really making this feel like a lived-in world. The likes of Bruce Willis and Brad Pitt were great not just because of their A-list status, but also they played their parts perfectly. Unfortunately, given it has been over 20 years since the show debuted, some of these have passed on. In light of the cast getting back together, it?s time to remember those who?ll be hosting their own reunion at the great big coffee house in the sky.